Note seasonality charts on Emerging Markets, Industrial Production and Job Openings. 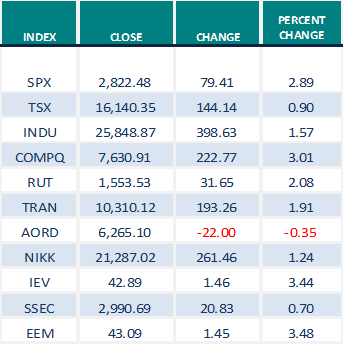 U.S. equity indices recorded nice gains last week. However, once again, the S&P 500 Index began to lose momentum just above the 2820 level and the Dow Jones Industrial Average stalled near the 26,000 level. Indices are responding to declining first quarter earnings expectations. 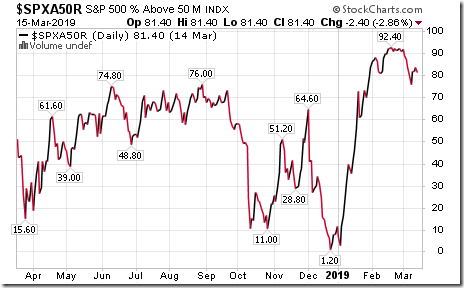 Consensus for S&P 500 earnings is a drop of 3.6% on a year-over-year basis. Consensus for S&P 500 companies with 50% or higher revenues from international operations is an 11.2% year-over-year decline. Commodity prices continued to move higher last week. On Thursday, the Commodity ETN (Symbol: GSG) completed a reverse Head & Shoulders pattern on the charts. ‘Tis the season for commodity prices to move higher to the end of April! 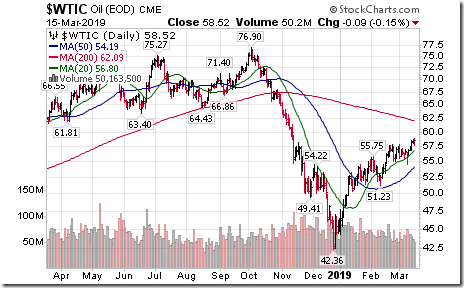 Crude oil and natural gas prices led the advance in commodity prices Crude oil broke to a four month high on Wednesday. Natural gas prices responded to another drop by U.S. inventories to a five year low for this time of year. “Gassy” stocks such as Chesapeake Energy, Apache and Baker Hughes recorded gains last week of 7% or more. More news in the cannabis sector last week! Nelson Peltz received an option to purchase 20 million shares in Aurora Cannabis or potentially about a 20% interest in the company. Hexo announced acquisition of Newstrike Brands in a share exchange valued at $260 million. Zinc prices are moving higher as LME zinc inventories move lower. Zinc stocks are responding. 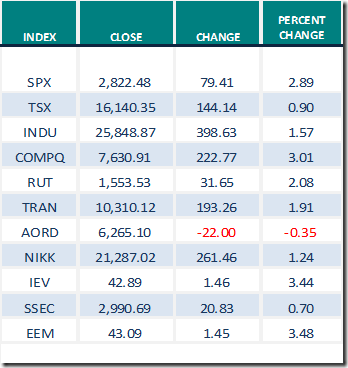 Overview: North American equity markets are in a bear market rally. Better opportunities exist in equity markets outside of North America and in commodities. 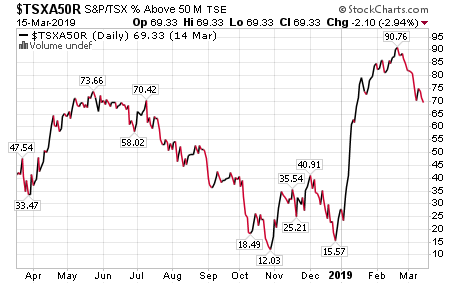 From February 1st to now, TSX Composite Index and S&P 500 Index added only 4.1% while the Dow Jones Industrials advanced only 3.1%. 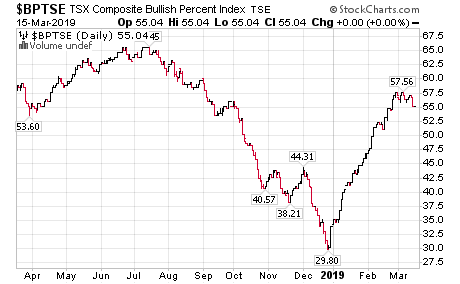 Best performing developed nation equity index since February 1st: Shanghai Composite Index: Up 15%. 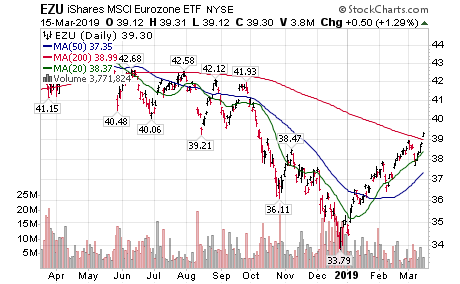 Honourable mention: the Europe ETF (IEV), up 5.5%. Seasonal influences for both are positive to the end of April. Seasonal influences are positive to the end of April. Gasoline prices in Vancouver moved from $1.22 per litre at end of January to $1.46 now and are expected to increase to $1.51 on Monday. Seasonal influences are positive to the end of May (Memorial Day holiday). 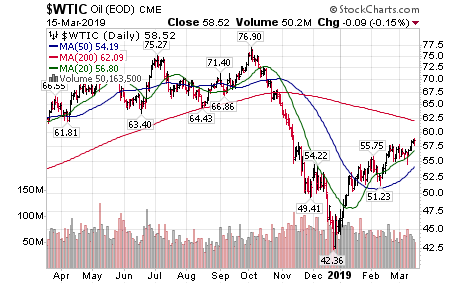 Crude Oil: Broke above $57.88 on Wednesday to a four month high extending uptrend. 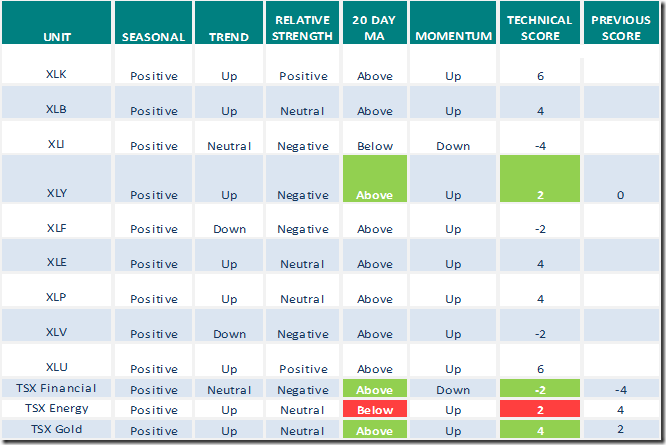 Seasonal influences are positive to July. Seasonal influences are positive to the end of May. Seasonal influences are positive until early May. Successful trade negotiations with China already are mostly anticipated by equity market. Canadian Dollar may have reached a seasonal low last week at 74.25 cents U.S. Inventory levels in the lower 48 U.S. states are at a five year low. Price bottomed this year in mid-February at $2.54. A move above $2.90 will extend the recovery. The bear market rally in U.S. and Canadian equity markets was revived last week. North American equity markets remain intermediate overbought despite a recovery in short and intermediate technical indicators last week. 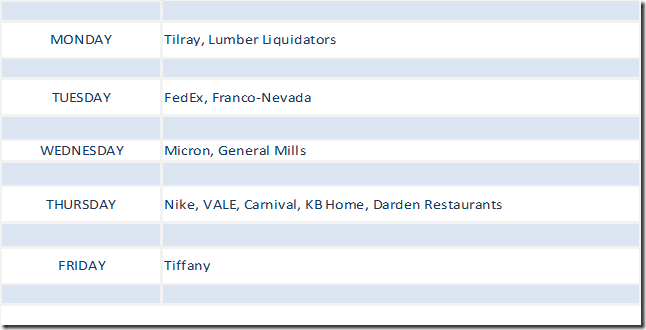 Technical action by individual S&P 500 stocks recovered last week. 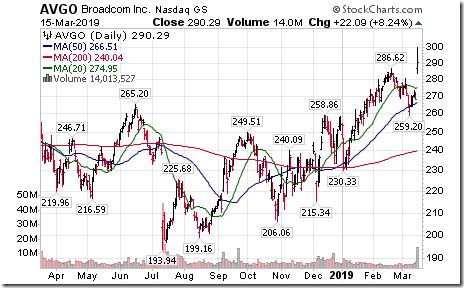 Number of stocks breaking intermediate resistance totaled 31 while number of stocks breaking support totaled 6. The Up/Down ratio increased to (253/149=) 1.70 from 1.55. 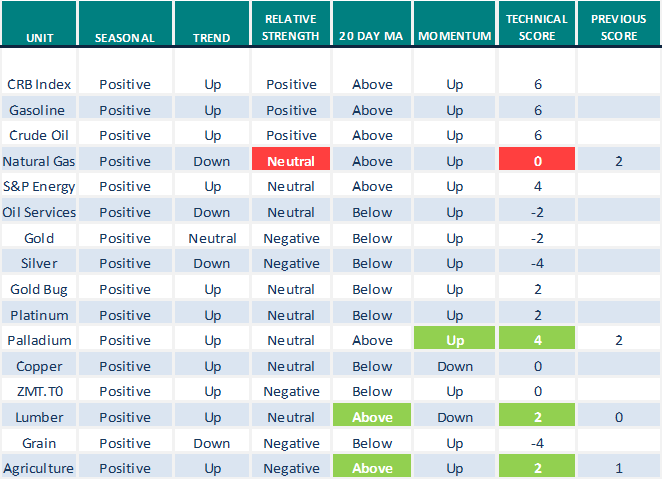 Medium term technical indicators in Canada moved slightly lower again last week, but remain overbought. 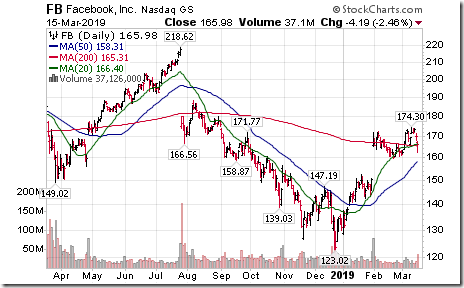 See charts near the end of this report. 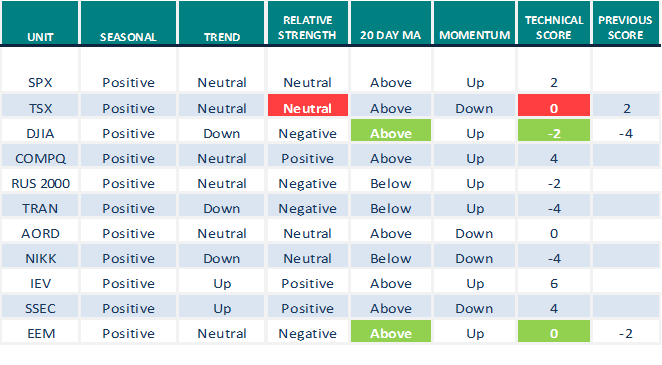 Short term technical indicators for U.S. markets and sectors (20 day moving averages, short term momentum) moved higher last week. 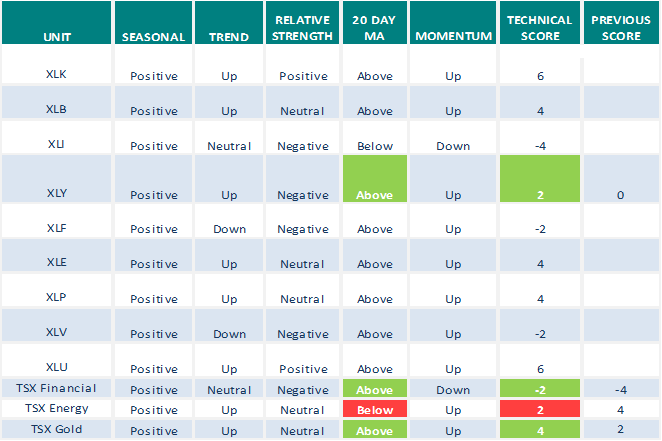 Short term technical indicators for Canadian markets and sectors also moved higher last week. Short term political concerns remain elevated. Issues include heightened tariff wars between the U.S. and China, anti-Trump hearings initiated by the Democrat controlled House of Representatives and expected release of the Mueller report. Prospects for S&P 500 earnings were reduced once again last week. According to FactSet, first quarter earnings are expected to decline 3.6% (up from a decline of 3.4% last week) but revenues are expected to increase 4.9%. Consensus by S&P 500 companies with 50% or more of sales realized outside of the U.S. calls for a year-over-year decline of 11.2% in earnings and only a 0.7% increase in sales. Second quarter earnings are expected to increase 0.1% (down from an increase of 0.3%) and second quarter revenues are expected to increase 4.6%. Third quarter earnings are expected to increase 1.8% and revenues are expected to increase 4.4% (down from 4.5%). Fourth quarter earnings are expected to increase 8.1% and fourth quarter revenues are expected to increase 4.8%. 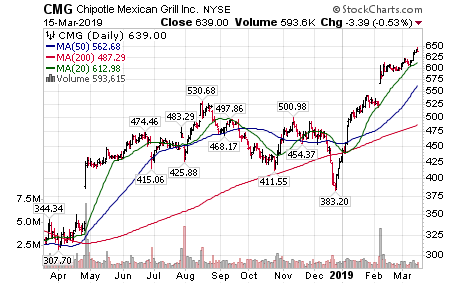 For all of 2019, earnings are expected to increase 3.8% (down from 3.9%) and revenues are expected to increase 4.9% (down from 5.0%). 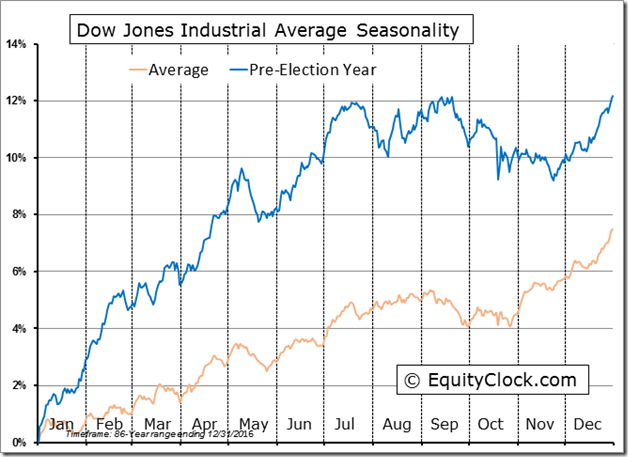 Seasonal influences in the first and second quarters of a U.S. Pre-Presidential Election Year are favourable. Gains this year already have exceeded average gains in the first and second quarters. January Factory Orders to be released at 10:00 AM EDT on Tuesday are expected to increase 0.3% versus a gain of 0.1% in December. Canadian Federal Budget is released at 4:00 PM EDT on Tuesday. FOMC statement is released at 2:00 PM EDT on Wednesday. No change in the Fed Fund rate at 2.50% is expected. Press conference is held at 2:30 AM EDT. Weekly Initial Jobless Claims to be released at 8:30 AM EDT on Thursday is expected to slip to 225,000 from 229,000 last week. March Philly Fed to be released at 8:30 AM EDT on Thursday is expected to increase to 5.0 versus a drop of 4.1 in February. February Canadian Consumer Price Index to be released at 8:30 AM EDT on Friday is expected to increase 0.2% versus a gain of 0.1% in January. January Canadian Retail Sales to be released at 8:30 AM EDT on Friday are expected to increase 0.4% versus a drop of 0.1% in January. February Existing Home Sales to be released at 10:00 AM EDT on Friday are expected to increase to 5.10 million units from 4.94 million units in January. Technical action by S&P 500 stocks to 10:00: Bullish. 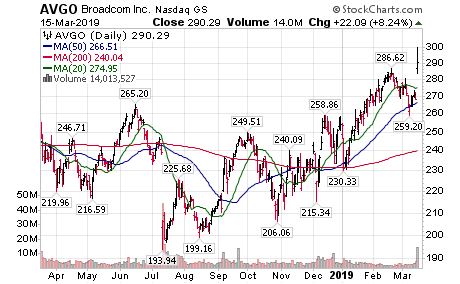 Intermediate breakouts: $ULTA $PSX $DFS $AVGO $LRCX $TXN. No breakdowns. Editor’s Note: After 10:00 AM EDT, intermediate breakouts included BDX, JKHY, HLT, CB, SYF, CLX and BR. Breakdown: CBS. 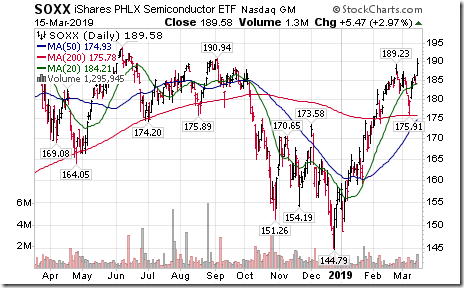 Strength in U.S. indices led by semiconductors. 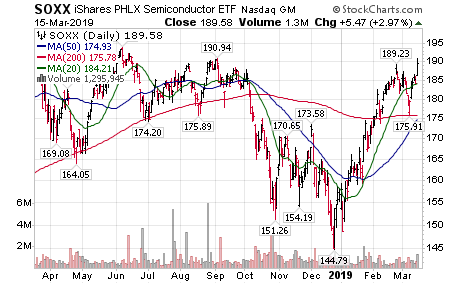 $SOXX moved above $189.23 and $SMH moved above $106.27 extending intermediate uptrends. 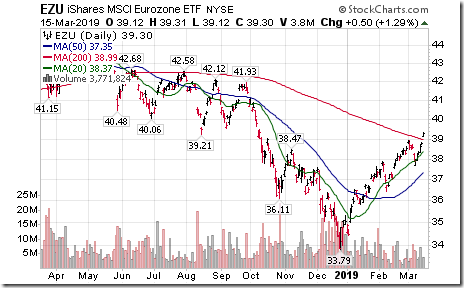 European equities and related ETFs continue moving higher. 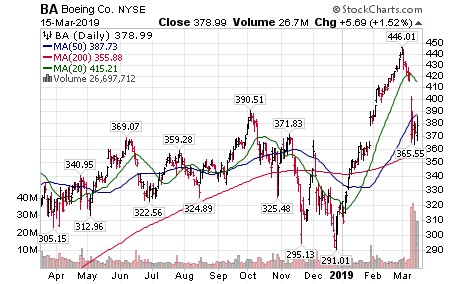 $EZU moved above $38.95 extending an intermediate uptrend. 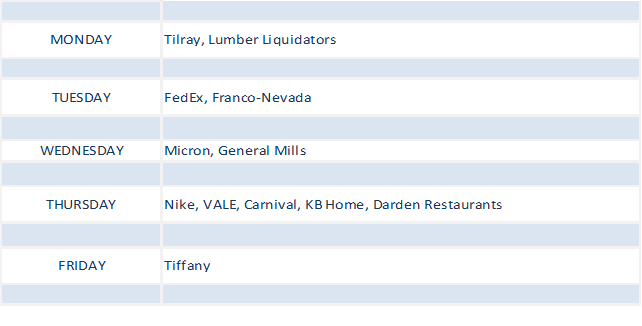 Percent of S&P 500 stocks trading above their 50 day moving average increased last week to 81.40 from 75.80. 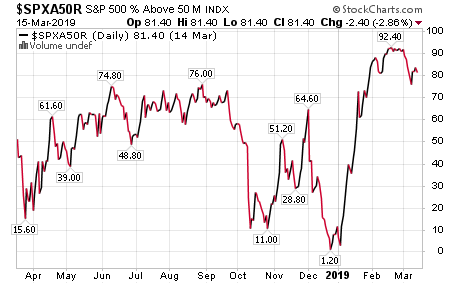 Percent remains intermediate overbought and has rolled over. 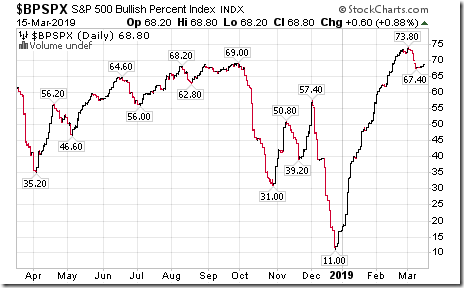 Bullish Percent Index for S&P 500 stocks increased last week to 68.80 from 67.40. The Index remains intermediate overbought and has rolled over. 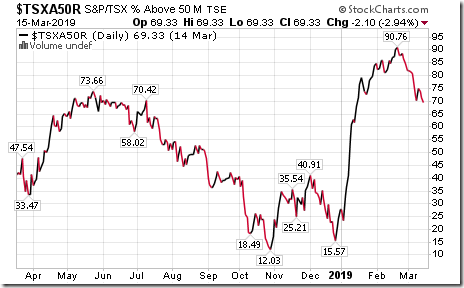 Percent of TSX stocks trading above their 50 day moving average slipped last week to 69.23 from 70.17. 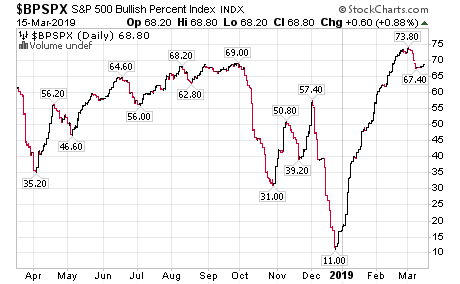 Percent remains intermediate overbought and trending down. 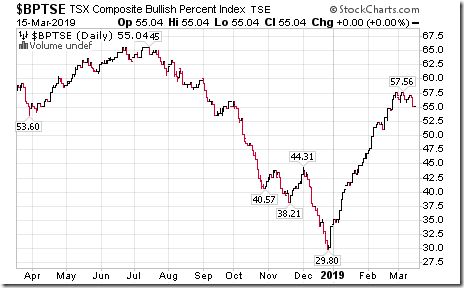 Bullish Percent Index for TSX stocks slipped last week to 55.04 from 56.30. 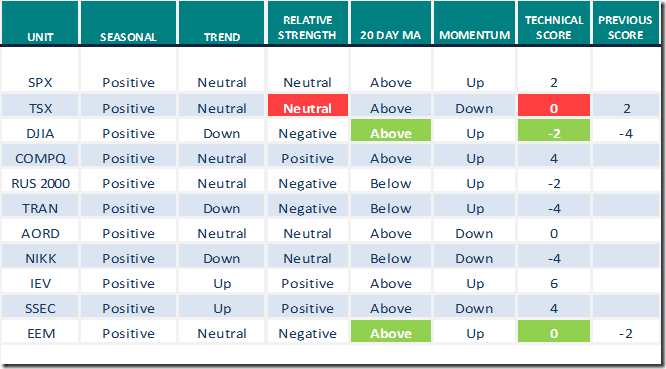 The Index remains intermediate neutral and has rolled over. Here is Michael Campbells show with Don. The break higher is starting to look more convincing. Friday’s volume was highest YTD and almost double the average on the SP500. It’s all very incremental. You wonder at what point the the bears capitulate. Appreciate your periodic updates. Thanks. 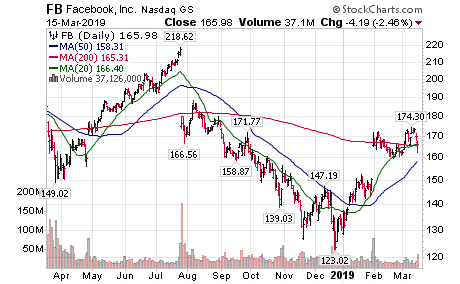 thanks for recommending Rage on Netflix…….love it……I see Don still refers to this as a bear market rally again in to-day’s comments…..would you agree?……. Tnx Ron for all your time and expertise…..
Re 3 – Your welcome Mary. Thought this would break to the downside on Friday and today. I will give it until tomorrow closing.